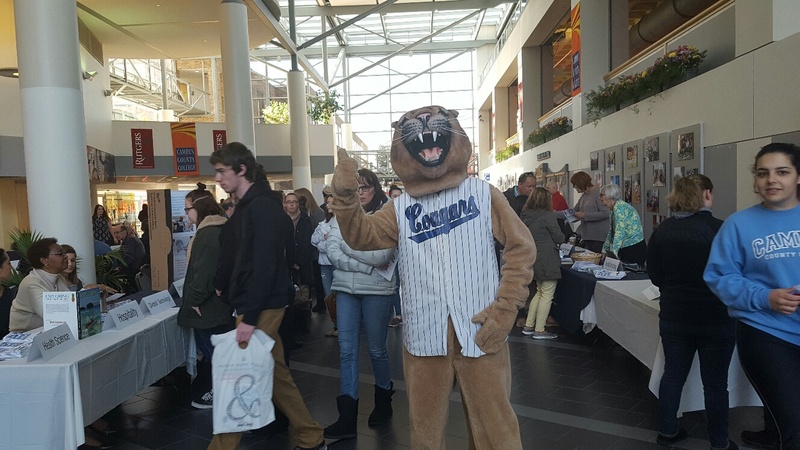 BLACKWOOD – More than 300 people attended Camden County College’s open house on April 8. The event displayed a myriad of majors throughout the Otto R. Mauke Community Center to high school juniors and seniors seeking to continue their education. The open house provided information on advising, student activities and tutoring, among other topics, in Taft Hall, where sessions on enrollment, payment and how to choose a major were held for those curious about entering college. The open house also offered a tour around campus, where visitors were taken on a shuttle bus and encouraged to stop and explore the many buildings at Camden County College. Susan Reilley, a teaching administrator for the nursing program on the Blackwood campus, presented information to aspiring students who have an interest in the field of medicine, explaining Camden County’s partnerships with Rutgers University and Our Lady of Lourdes in pre-nursing. Rosie Criearo, a junior at Triton Regional High School, spoke with Reilley about her interest in nursing. “I like helping people. I’ve been told I’m good at that in the past,” Criearo said. The aspiring medical student has already taken the steps to working as a part-time certified nursing assistant over the summer and wants to continue her education until the point of becoming a registered nurse, which Camden County could be a pivotal stepping-stone toward. Some of Camden County’s extracurricular programs made their presence known, such as that of CCC’s radio station, WDBK. The staff of the radio station provided music for the event, helped assist wandering guests and promoted an upcoming fundraiser they’ve organized with Mr. Softee. The fundraiser will take place from 3 to 9 p.m. April 28 at the Mr. Softee shop at 33605 Haddonfield Road, Pennsauken. A portion of the proceeds will go to WDBK. Tracy Turner, a teacher of business and applied technology at Pennsville High School, attended the open house with her son, who looks to start a career in the autotech industry. Considering Camden County College as an option, Turner said CCC offered prices half that of some of the technical schools she had looked into.